In an attempt to rejoin all existing participant boats of the 1968 Acapulco Olympic sailing regattas during summer 2018 for a 50th anniversary event, the search is on for 5.5 USA 68 "Cadenza". Who can help? 8th/14 at the XIX Olympics 1968 Acapulco, Mexico, Frank Gardner Cox Jr./ Stepehen Colgate, Stuart Hodge Walker, Cadenza, US-68, Britton Chance Jr. 1965, 7-8-8-4-9-8-6, 74.7p. Forty years ago, I had the privilege of being on the practice crew for F. Gardner Cox on US 68 ‘Cadenza’ – a Chance-designed hull. 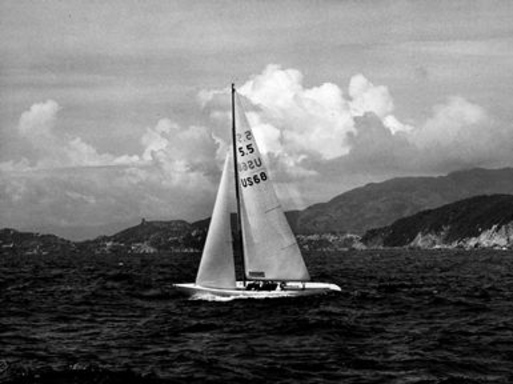 Sailing with Stuart Walker and Steve Colgate, Gardner went on to be the American 5.5 representative to the 1968 (Mexico City/Acapulco) games. Gardner died in 1988. I spoke with Steve Colgate about 2 years ago and he is not aware of Cadenza’s current location. I have sent a message to Bill Cox (Gardner’s nephew) and if I hear anything about the boat, I’ll pass it on. Don Cohan of Philadelphia (Bronze medal in the Dragon class in ’72) had a Chance 5.5 identical to Cadenza, but I can’t recall the sail number. It would make sense that it would be either US67 or US69, but really haven’t a clue.